Twirling ninjas and plastic bricks make a weird combination. 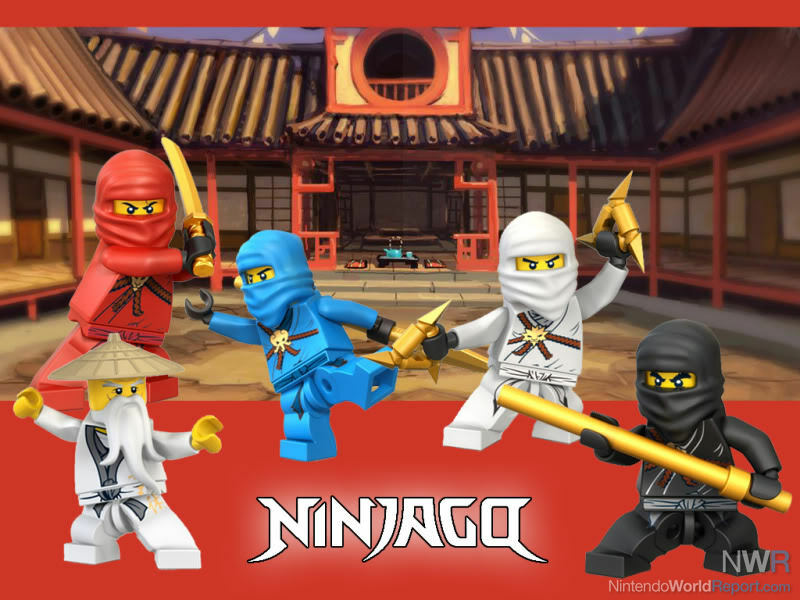 The latest in this declining trend is Lego Ninjago, which appears to center around a story of four different colored ninja-in-training, who are taught by their wise old sensei in the art of Spinjitzu. They fight to protect four sacred golden weapons from the evil Lord Garmadon and his evil Skeleton Army, who blaze across the feudal Japan-esque world on their magical motorcycles of doom. Once assembled, the Lego figurines are attached to spinning tops and fired at one another in a battle game that somehow also involves playing cards. Players of any previous Lego games will know what to expect at the base concept – travel through levels, beat up enemies, smash everything in sight for a seemingly endless supply of gold and silver Lego studs, which act like coin currency. Lego Battles is essentially a top-down, real-time strategy game in the same vein as the classic Warcraft formula, though in the Lego universe, it somehow makes more sense. Builder characters harvest Lego bricks that they use to build new structures, which in turn, use bricks to build new characters to fight with. 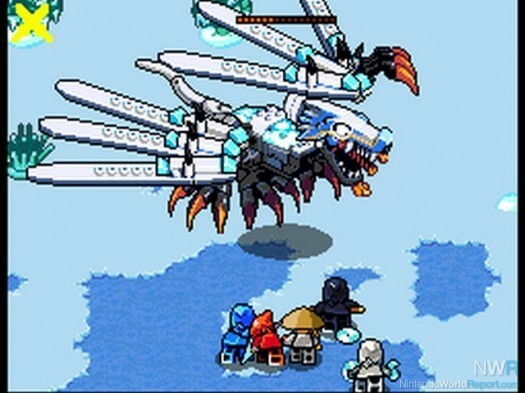 The game's main focus is on the single-player Story mode, but there is a battle mode thrown in for good measure, which can also be played in single-player, but allows for local wireless multiplayer as well. After the first Story mode act is cleared for the good Ninja clan, the Skeleton Army is unlocked and players can swap between good and evil to see both sides of the story. The opening cinematic shows the four multicolored ninja undergoing various training regimens, with the typical slapstick cuteness that the Lego games have become known for. Sadly, beyond the beautiful 3D animation of the cut scenes, the style is watered down into very basic 2D sprites for the rest of the game. The characters and buildings generally look like their plastic counterparts, but there is little shading, animations are lazy and simple and environments consist of bland, repeating tile pallets that give the whole presentation a cheap feel. The contrast, especially when viewing character biographies showing the 3D models surrounded by 2D cartoony Lego borders, is striking and unpleasant. This kind of thing feels outdated and would have been more at home on the Game Boy Advance. "Ow, that dragon ate my 3D!" The menu interface is also overly simplistic and lazy-feeling, often with a single button saying “continue” or a choice between a tick and a cross. A and B button inputs could have greatly enhanced these, especially when in a conversation with NPCs as the game freezes and forces you to repeatedly tap the small “continue” button after every line of dialogue. Controls are simple enough – tap a character in your party to select him, and tap where you want him to go. Draw a marquee around multiple characters to select a group, or double-tap a character to select all characters of the same type within range. However, the sprites' hit registration is sometimes quirky, particularly in congested crowds, requiring you to tap multiple times on an object before your Lego men get the idea to attack it. The camera does not follow any of the characters as they trek across the countryside, and must constantly be moved around with the D-pad, or face buttons if you're left-handed. Characters also have a habit of deselecting themselves randomly, which is infrequent yet still annoying. You're able to set waypoints by manually scrolling the map and tapping a location – just be sure not to tap too hard or accidentally draw a small line, or else your carefully chosen squadron will become deselected again. Your little Lego army is also quite bumbling getting from point A to point B, often moving incredibly slowly compared to other members of their party for no reason at all, and will even go out of their way to enter doorways against your instructions, then find themselves on the wrong side of the map. The game often suffers significant slowdown when you're controlling four or more characters and the levels are broken up between frequent loading screens showing a spinning, golden pretzel shuriken, something relatively unusual for a DS cart-based game, particularly one featuring such simplistic artwork. Like other Lego titles, there are a lot of things to unlock. Art, battle mode maps, and other bonuses can be purchased with accumulated currency, and there's a large list of trophies awarded for meeting certain conditions. Completing story acts for both sides will unlock additional characters to use in Battle mode, plucked right out of classic Lego franchises, such as Pirates and Kingdoms. There is some decent strategy action to be had, with each hero character having an upgradable list of attacks and spells and a variety of attack and defense options. Additionally, you have your pick of multiple buildings to plot out your village sites with. There are also quite a lot of missions to get through, with four story acts to play for both heroes and villains, each containing multiple levels. Still, none of it is particularly difficult, and wrestling with the awkward controls is probably as much of a challenge as the game itself is to complete. Planning strategies and allocating troops for tasks is likely too complex for the intended target audience's age group, yet the cute toy style isn't really edgy enough to appeal to older players. While the game can be quite enjoyable with patience and perseverance, the story premise is overdone and ridiculous, and Lego fans would be better off to play with the actual toy bricks.